The Power of Your Personal Development | Self Confidence | What's Your Wheelchair? Have you been longing to have a better life, but something has always stood in your way? If you’re like most people, you probably start well, but then Life happens, and before long you’re still at the same place in your relationship, job, weight or whatever it is that you’re trying to make better in your life. You end up feeling resentful and frustrated because you’re trying to figure out everything on your own and nothing you do seems to get you to that next level. to help you get focused and stay on track. However, the BIG problem with this option is that good life coaches are extremely expensive with many coaches charging over $400 PER MONTH for individual coaching sessions. That’s why today, I’m thrilled to be able to share with you my new training program, The Power of Your Personal Development. 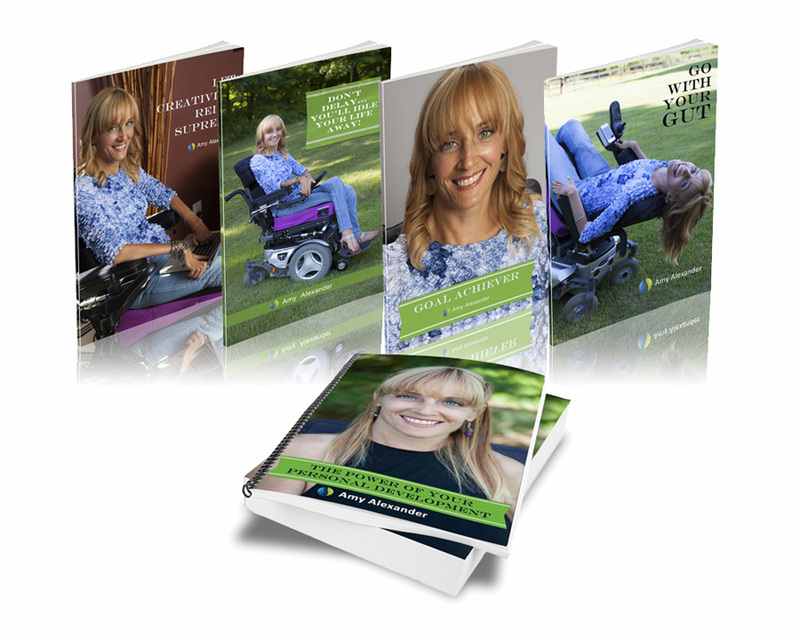 I’m Amy Alexander, author of the inspirational books What’s Your Wheelchair and Strip it All…and be Naked! that has inspired many people around the world. In my latest training program, The Power of Your Personal Development, I reveal the exact steps you need to follow in order to achieve your most important life goals faster than ever before. Whether you’re trying to lose a few pounds, create a profitable business or even find the love of your life, the Power of Your Personal Development gives you the missing piece of the puzzle you need to finally make your dreams a reality. out there, is that this isn’t just a collection of ideas or principles. It’s a simple, step-by-step FORMULA. All you need to do is take your most important life goals, apply the formula and you WILL get results. Here’s everything you’ll get within this amazing course. Now you may be asking yourself how much a Personal Development course that delivers this much value is going to be. And that’s a fair question given that in the past the only way to achieve the life you deserve, was to hire a high valued Life Coach and spend thousands of dollars to have them help you achieve success. However, the reason I created the online version of The Power of Your Personal Development is to make this life changing information available to everyone who wants to break free from their current circumstances and achieve health, love, money and the time to enjoy them. So let’s just make this a simple decision for you Okay? with Q&A sessions for a single one time payment. So here’s your chance to get the life you want. Just click the “Add to Cart” button you see below. And you’ll be glad to know that The Power of Your Personal Development comes with my personal 100% Rock Solid, money back guarantee. Don’t you think, you’ve been struggling to achieve your life goals for long enough? And the missing link you’ve been searching for to finally turn your hopes and dreams into reality is just a few clicks away. Picture right now the moment you achieve your most important life goals. You’re looking fit, lean and healthy, your business is booming, and you’re surrounded by the love of your friends and family. That’s what I want for you, and I know it’s what you want for yourself, so get access to The Power of Your Personal Development now and let’s get you started today! PS. Remember, you’re covered by my “No-Questions-Asked” 100% Money Back Guarantee. All the risk is on me, and all the benefits are on you. If it turns out that you don’t like The Power of Your Personal Development, simply contact me and I’ll promptly refund you in full. Get a better life starting now by Clicking the Add To Cart button above to get started immediately!